I’m starting to suspect that aioli (garlic mayonnaise, for the uninitiated) makes everything taste better. When I go out to eat, if I see a dish that comes with aioli, I’ll pretty much order it no matter what it is. Fries with aioli? Yes please! Frog legs with aioli? Ehh…. I might do that too. Given this minor obsession, it was only natural then that I would try to make it in my own kitchen. You see, then I could eat aioli with every meal, possibly excluding my breakfast cereal. Well, it turns out that making aioli is hard. Three attempts later, I’ve wasted two lemons, countless egg yolks, and more olive oil than I care to think about. My poor food processor nearly burnt out during my neurotically slow drizzling of olive oil, which somehow must not have been neurotic enough. I still haven’t given up – if anything I’m now obstinately determined to conquer aioli – but I figured I’d comfort myself with something a little less finicky before the whole endeavour got too depressing. 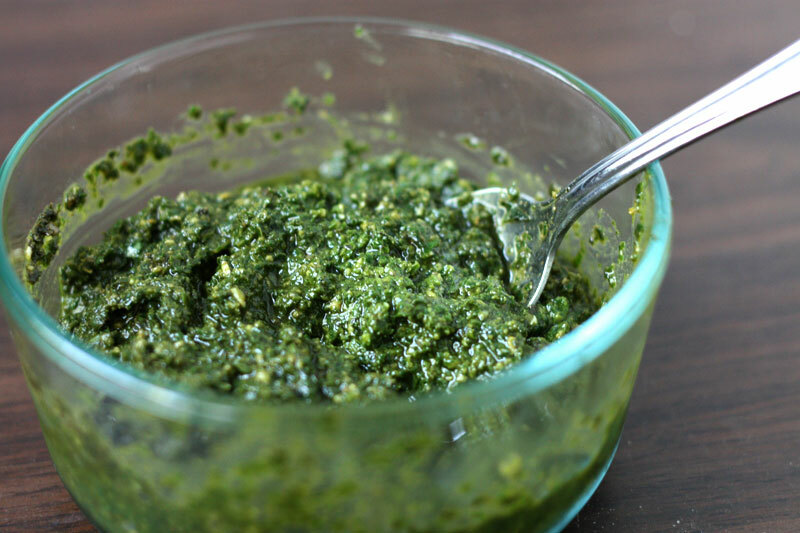 So, basil’s answer to aioli: homemade pesto. And a tasty one it is, plus it doesn’t come with the raw egg concerns – always a bonus, although I figure I’ve probably already developed an immunity through my massive cookie dough intake. 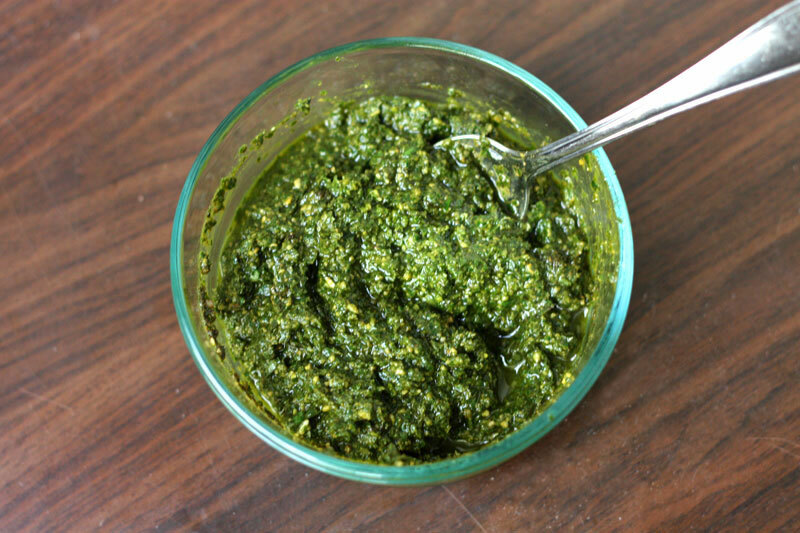 Pesto is lovely in its own right, straightforward to make, and super versatile: I like it best on pasta, grilled vegetables, and sandwiches. I don’t think it could quite entice me to order frog legs, but I can’t rule it out. A tip I learned from my dad: I find that a little block of pesto is just the right amount for a single serving, so I freeze pesto in ice cube trays, then pop them out once they’re hard and transfer to a freezer bag. Then it’s easy to grab as many cubes as you need, microwave on low, and whisk in a little more oil if needed. In a small dry skillet, toast pine nuts over medium heat, stirring frequently, until golden, about 5 minutes. If you don’t want to use raw garlic, toast the unpeeled cloves in the same skillet until slightly darkened, about 7 minutes. (I prefer to use the raw garlic.) Peel and mince the garlic cloves. 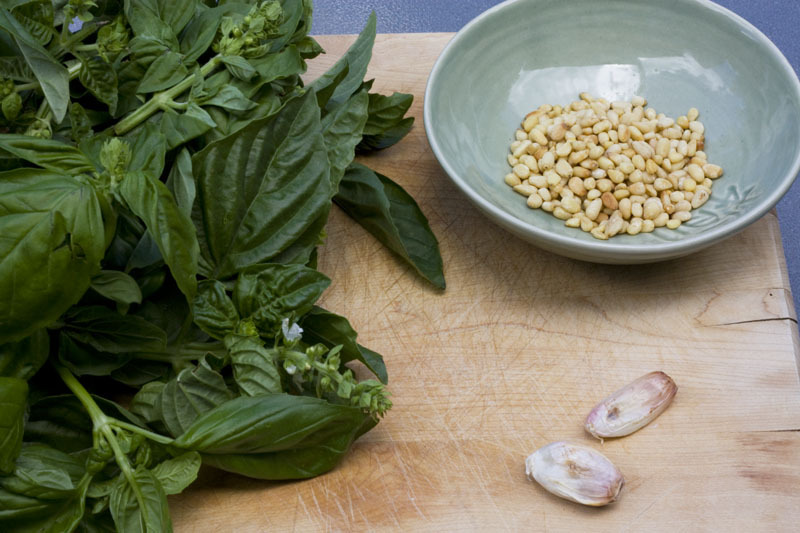 Combine basil, garlic, nuts, and oil in a food processor and process until well blended, scraping down sides if needed. Add more oil to thin to desired consistency. If freezing, do so before adding cheese – if not, stir cheese into pesto. Taste for seasoning, you will probably need to add a pinch of salt. I’m surprised at how healthy the ingredients are. For some reason I thought that it was laden with butter? Haha, silly me. Hey! 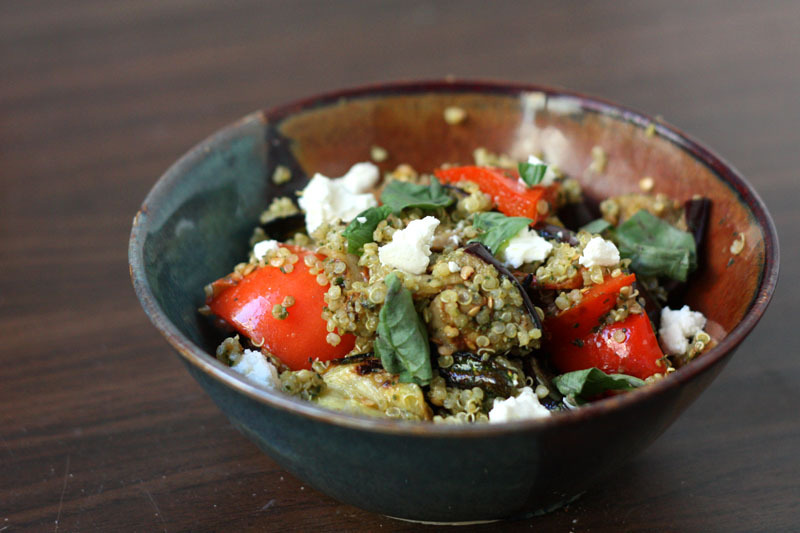 I found your recipe for pesto on tastespotting. I have a question: the recipe says to add the cheese after freezing. How do you manage that? When you thaw a cube of pesto, do you just shred in a little bit of cheese? Or did you freeze it with the cheese in anyway? Brenna – it’s better frozen without the cheese, but you can also freeze it with if you would rather. I usually freeze it without, and just stir in a bit of cheese after thawing the cube. The exact proportions aren’t all that important so you can really just do it to taste. Hope that helps! good ice cube tray tip! Hi! Stumbled upon your site via Tastespotting. I clicked through to this post from your Vanilla Cheesecake recipe 🙂 For your aioli you should check out: http://www.epicurious.com/recipes/food/views/AIOLI-107026. I put everything but the oil in the bowl of my miniprocessor, then use the holes in the processor lid to drizzle in the oil. I’ve not had a bad batch yet! Also, I too make and freeze my batches of pesto. Much easier to grab a cube when basil is called for than buying a whole fresh bunch. Great posts! You are currently reading classic pesto at one cake two cake.